This Fool plans on staying far away from the story stocks of Resolute Energy and Northern Dynasty Minerals. 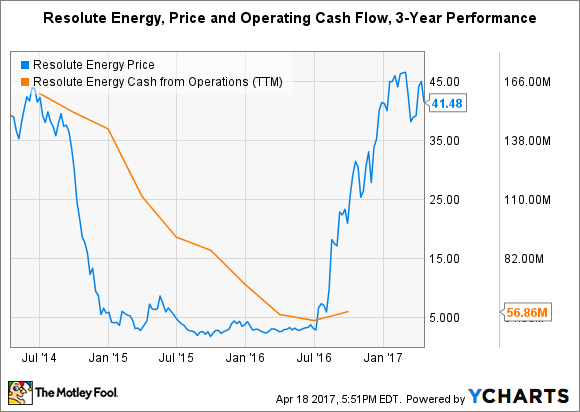 But FMC Corporation is a lithium stock worth considering. Investors in the past year have run toward the opportunities that oil and gas producer Resolute Energy (NYSE:REN) and mining company Northern Dynasty Minerals (NYSEMKT:NAK) have presented. Both have seen dramatic and virtually overnight shifts in their future prospects. The former has, like many other oil producers large and small, bet heavily on the notion that the Permian Basin represents the second wave of the American shale revolution. The U.S. Geological Survey estimates the Wolfcamp shale formation in the Permian holds over 20 billion barrels of oil, and that is in just one of several shale formations across the Permain. Meanwhile, the latter is riding higher on hopes that federal environmental deregulation will allow it to finally begin the long process of exploiting the vast mineral wealth of its long-held Pebble Project in Alaska. It remains one of the world's largest undeveloped gold and copper deposits. Despite the tremendous reversals for both, I tend to stay away from story stocks -- although there are other reasons I'd never buy Resolute Energy or Northern Dynasty Minerals. On the other hand, FMC Corporation (NYSE:FMC), one of the leading lithium stocks on the market, ranks highly on my watchlist. Here's my rationale for each stock. The collapse of crude oil prices at the end of 2014 crushed Resolute Energy. A major write-off of properties and reserves in 2015 pushed its debt-to-assets ratio north of 100%. Revenue was cut in half from historical levels, and operating income turned negative. But the company is on the cusp of returning to past levels of production, or greater, and cleaning up its dreadful balance sheet. The stock has certainly responded to the potential, maybe a little too strongly. That's the problem I have with the stock. More specifically, there's a strong argument to be made that much of the upside is already priced in at current levels. Consider that shares are trading north of $40 for the first time since the second quarter of 2014. During that quarter, Resolute Energy reported revenue of $88.4 million, operating income of $6.9 million, and shareholders' equity of $519 million -- all well above marks set in the most recent quarter. In the fourth quarter of 2016, the company notched revenue of $63 million, an operating loss of $1.4 million, and shareholders' equity of negative-$76 million. While it's possible that the Permian Basin will deliver success for the company in the long term, I simply don't feel comfortable owning a stock worth $1 billion that sports negative book value and a questionable history of operations. 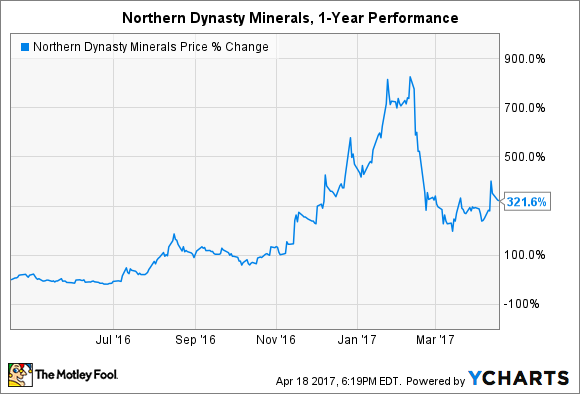 Much ink has been spilled over the potential for Northern Dynasty Minerals to become a great mining stock, especially since the November election put President Trump and his deregulation-friendly agenda in office. Less scrutiny at the federal level would grease efforts to successfully complete the permitting process, which would hopefully lead to development and mineral extraction. Given the vast stores of mineral wealth held in the company's Pebble Project, investor enthusiasm is easy to understand. However, the initial excitement from a press release or development never seems to stand up to additional digging. For example, Northern Dynasty Minerals recently announced that the Alaska Department of Natural Resources approved a Miscellaneous Land Use Permit (MLUP) for the Pebble Project. The news sent the stock soaring 34%. But the fact is that the Alaska DNR grants thousands of MLUPs each year. More importantly, the one granted to the company came with a few strings attached, such as more frequent site inspections than normal, the requirement to post a $2 million bond in case it went bankrupt and drill sites needed to be cleaned up, and the fact that the permit is active for the minimum amount of time permissible by law. Those details were left out of the company's press release, which doesn't instill much confidence in the ability of management to be fully transparent. The dizzying volatility and lack of any historical precedent for executing against management's goals makes it easy to pass on the stock. The massive shift toward electric vehicles is just getting started and has put a bright spotlight on lithium stocks. There are no shortage of tiny, micro-cap stocks promising investors the sky without much more to show than a patch of dirt somewhere in South America. There are also three major lithium producers that are worth a closer look -- and FMC Corp. is one of them. The fact that it's well positioned to exploit the upcoming growth in lithium demand has been the driving force behind the stock's performance in the past two years. That's despite the fact that the lithium segment has been FMC Corp.'s smallest contributor to the top line, historically speaking, but probably because management has plans to triple production capacity for battery-grade material by 2019. The largest segment has been agricultural solutions, which just got a lot bigger. Last month, the company announced the acquisition of DuPont's crop protection business, including three of the world's top-selling insecticide products, which put shares on a rocket ship ride higher. The unit is expected to generate $3.8 billion in sales in 2017, making FMC Corp. the sixth largest agricultural-products company on the planet. Combined with the company's ambitious plans for lithium production expansion, this stock is worth considering for any portfolio. Every investor has a risk level he or she is comfortable with. While I'm willing to take on some risks others wouldn't, my appetite stops shy of story stocks such as Resolute Energy and Northern Dynasty Minerals. 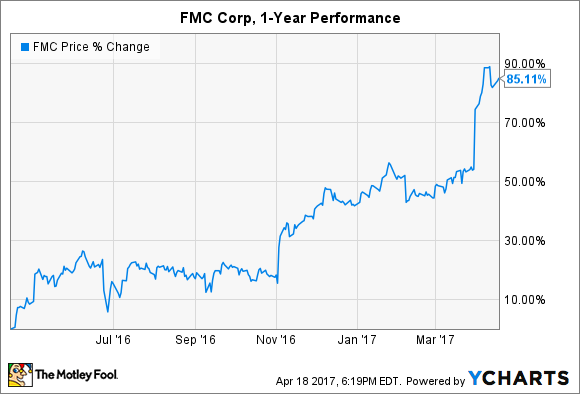 I would much rather consider stocks that are well positioned to capitalize on long-term trends, which is why FMC Corp. ranks highly on my watchlist.